About Clicking & Business. Because every click means (or may mean) business! 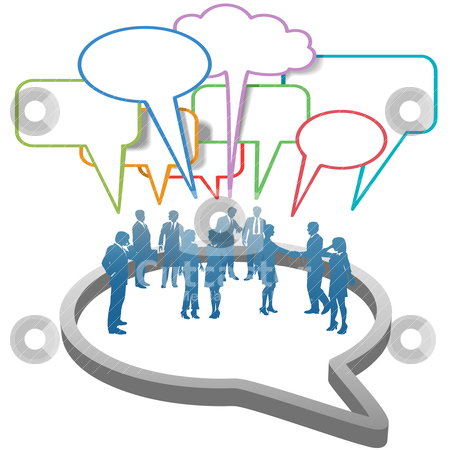 Social business: much more than social networks? Social media vs. conventional media: who do you trust? ThePhotoMaster.com – Digital photo news, digital cameras reviews, imaging technologies and fun! iPodPalace.com – The place to look for iPod info! Jobely.com – job opportunities around the world! Search for job, hiring & consulting postings by keyword and/or country! Thousands added every day! MacSwitching.com – The resource to people switching to the Mac (and to MacLife altogether): Mac OS X integration, Mac-Windows interoperability, iPod and most Macintosh-related topics! This cool post from CrowdShifter gets deep into social media and finds what does social business mean. What Does Social Business Really Mean? Social businesses implement social technologies, strategies and processes that span across their entire enterprise, creating and optimizing collaborative ecosystems of employees, customers, partners, suppliers, communities and stakeholders in a safe and consistent way. To transform into a social business, companies need to have more than a mere linear presence on Facebook, Twitter, LinkedIn, Google+ and blogs. To achieve this, successful businesses must align their core goals and objectives in cross-enterprise collaboration and create a socially integrated organizational blueprint that focuses on people and culture. Who do people trust during election season? Twitter has been working up to its more broadly offered self serve ad platform for a while now. To this point, there are about 100 advertisers that have been allowed to use the system but Twitter is about to expand that capability significantly as it looks to make 2012 a big year. This strategy is part of a larger plan for the social media company to reach the election year groups and international advertisers as well. It’s starting to look like Twitter plans to make some money. The latest roll out is in partnership with American Express, so only Amex cardholders or merchants who accept Amex can sign-up. In return Amex will give each buyer a $100 credit to sweeten the deal. While the number of places available on the platform is limited for now, Twitter told AllThingsD that it will let in more buyers throughout the year in further groups of 10,000. It shows that Twitter is serious about making money from advertising but is retaining a cautious approach, presumably so it can modify and develop the platform as it lets in more users. The self-serve approach has worked well for Google and Facebook, so it is no surprise to see Twitter following suit, however it will have to overcome doubts about how effective its platform is. Here is a poker of simple (yet powerful) tips to increase and mantain Twitter visibility. I know some of you are still skeptics as to how social media can do anything for your business, but Twitter is one of the most powerful and people-reaching tool these days. Optimize your page and tweets – Just as you would use optimized copy for your website, do so for your Twitter account by posting keyword rich tweets and profile information. Use target keywords on your profile page and make sure to use keywords in your Tweets. Optimize your Twitter Bio – This is an extension of the above rule. In search results, the bio section of your Twitter profile acts as the description metadata. You will want to make sure it is optimized to increase click-through rates. Link – You will responsible for most of your initial Twitter traffic when you first create your profile. Help your Twitter presence become popular by posting links to it on your main website and other social media channels. You should also include a link to your Twitter account in any new content you create. This will help your new account catch on with users. Link Back – This is an important part of having a Twitter account: it’s an avenue to build links to your other content. Make sure the URL to your main site is posted in your profile and tweet about any new articles or content you produce. A lot of times when people are having problems in their work, they’ll send out a tweet asking for help. If you’ve got some spare time or knowledge in the area, offer to help them through Twitter for free. Eventually, you’ll need help and they’re more likely to help back. Also, if it’s a potential client asking for a bit of advice or criticism, make sure you do everything you can to be the first to respond. They’ll remember you later when they need to hire a new freelancer. Topguest, a San Francisco-based startup focused on loyalty programs and travel, has been acquired by ezRez Software, Inc.
As exits go, this one was pretty speedy: The startup was giving sneak peeks of its still-in-beta software just 18 months ago. While Topguest will continue to operate under its current branding, the combined company is set up to give customers a full-fledged technology platform for loyalty programs. Facebook announced Wednesday morning it has reached its 500 millionth member. Due to privacy constraints, we won’t know exactly who that is, or where; and there’s no prize waiting for him or her. The site, which launched in 2004, has gained around 100 million new users in the last six months. Nonetheless, those numbers generate some huge and interesting statistics in the aggregate. Facebook users have uploaded 50 billion photos (and tagged 15 billion of them). Einstein, Twain, Wilde, Gandhi and Shakespeare are among the most quoted people on profiles. Facebook has grown up since it began as a haven for only a few select universities in 2004. About 70% of Facebook’s users now live outside of the United States, with the Middle East, Indonesia, Malaysia, Singapore, India and Brazil becoming some of the fastest growing regions. As for Facebook Stories, the to-be-unveiled service will serve as a launching ground for the various user stories that Facebook users have been submitting to the site. Up until this point, user tales have been individually featured as part of the “Your Stories” section of Facebook’s official blog. Facebook Stories, in contrast, will feature organized the submitted, 420-character-or-less anecdotes by geography or theme—like, “finding love,” “coping with grief” and “natural disasters,” reports Swisher. Users will be able to link their stories to their Facebook profiles and, naturally, Facebook’s 500-million user base will be able to comment on and “Like” the stories as they see fit. Facebook said the number was “an important milestone” and added that it was “humbled and inspired” by the stories of its users, which it is asking people to share on the site. According to Mashable “Amazon: Kindle Books Now Outselling Hardcovers”. “Over the past three months”, according to an Amazon statement, “for every 100 hardcover books Amazon.com has sold, it has sold 143 Kindle books. 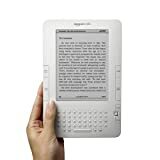 Over the past month, for every 100 hardcover books Amazon.com has sold, it has sold 180 Kindle books.”. This trend may become the norm compared to the outstanding Christmas-day-only ebook result. Among other reasons, Apple iPad competition has driven price lowering for Kindle devices, giving them much more appeal to consumer willing only to read books. The bottom line tells us there’s a market out there for ebook still to be tapped, be it from Apple’s new iBook store or from the already-estabilished Amazon Kindle store (and that Kindle is far from dead…). According to the technology blog TechCrunch, Elevation Partners, the private equity firm backed by bad-backed U2 frontman Bono, has stumped up $120m for just over 0.5 per cent of Facebook. The deal values the dominant social network at $23bn, and takes Elevation Partners’ total stake to 1.5 per cent, having invested $90m at a $9bn valuation last year. Reports earlier this month claimed Facebook’s sales were between $700m and $800m last year, so Bono and friends reckon it’s worth about 29 times revenue at the moment. Which is a lot. Elevation Partners mission is about helping media and entertainment entrepreneurs develop and deliver content, leverage new platforms and channels, namely social networks and social media assets. Facebook is still growing at an incredible rate, and recently hit 500 million users, further fueling hopes that the still private company might seek to go public sometime soon, but most IPO observers have said they don’t expect Facebook to file anytime this year, even if the market gets a slight psychological boost from the Tesla Motors Inc.IPO on Tuesday. So Elevation probably will likely be holding its investment for awhile. Venture Beat reports also that Bono Vox has invested on its own too in the social network, in addition to the Elevation Partners deal, along with founder Roger McNamee, showing a strong confidence in Zuckerberg’s idea and project. More info are available here and here. Frankly speaking I love free guides: they give such good hints on premium guides and immediate tips on what’s up in the market. Who’s Blogging What now gives an opportunity to delve deep into Facebook Page Marketing. The 30-page guide has truly interesting (albeit not completely new) tricks&tips regarding the Facebook Page arena; a recommended reading is Getting People To ‘Like’ Your Facebook Page by Lisa Barone. You have to make people want to join your Facebook page. It’s simple: You can’t market to or build brand awareness with someone who’s not opted in. What’s not simple is getting a user to hit that ‘like’ button. Users are a lot more discerning on Facebook than on other social sites. For them to opt into your page, they need a compelling reason. It’s a big step from passively liking a brand to publicly ‘liking’ them in full view of friends and colleagues. You have to make it worth their while. That’s as simple as it seem even though a tough goal to reach. 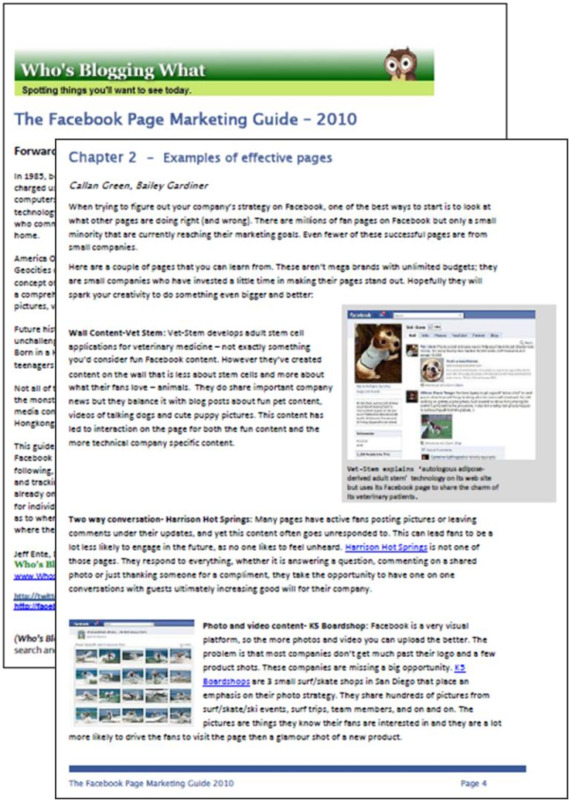 Get the Facebook Page Marketing Guide by clicking here, it’s free, it’s fun and may be useful too.